Made with the highest quality clay and all-natural ingredients, this poultice is safe to use for extended applications, alone or under wraps. 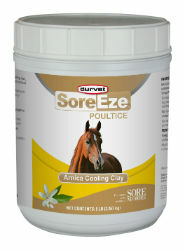 Sore-Eze™ Poultice is an effective poultice for reducing heat, inflammation and preventing injury. Made with high quality Bentonite clay, the base for many human facial masks, this poultice has a smooth consistency for easy application, reducing the need to use large amounts for application. Sore-Eze™ Poultice is great for use in addressing abscesses as the clay helps draw out toxins and bring pockets to the surface, reducing recovery time. Removing the poultice is just as easy as applying. Unlike other poultices, this poultice can be easily brushed out or hosed off without scraping or scrubbing. Once applied, this poultice can be left unattended, alone or under wraps, as there is no risk of burning or irritations when left for extended periods of time like other poultices. For use on Horses of all classes. Leg: Apply a thin layer of Sore-Eze™ Poultice directly to surface of leg. Use with or without paper or plastic (plastic increases heat exchange). Washes off easily. Hoof: Apply directly to hoof. Use several times a week or before and after shoeing to increase moisture to ensure a soft, pliable, resilient sole, frog and hoof wall. Bentonite (bowie type clay) and a proprietary extract of witch hazel bark and leaves with the following common herbs: arnica (Arnica montana), rosemary (Rosmarinus officinalis), lobelia (Lobelia inflata), bergamot blossom (Citrus aurantium L. subsp. bergamia), and sodium borate (as a preservative).